A lot on our plate: The Brits are ahead of us with an announcement about a new feature film about the suffrage movement under production! #1. #2. Do you know about the Suffragette Cocktail? #1 #2. The “anti” suffrage forces are on the move –the same old thing and with the attitude of a former generation. #1. #2. Video on how to make the best roast corn for your next cookout. Introducing Suffrage Wagon Cooking School. It’s part of our suffrage centennial series, and 2013 is the centennial of the “Spirit of 1776’s” first journey. You’ll love this way of cooking from Chef Cutting. Make your next cookout a sensation! August is perfect to begin planning for a high tea in early November to commemorate the Night of Terror. A quick refresher. This may seem early, but it’s also when planning should be underway on how to celebrate Elizabeth Cady Stanton’s birthday on November 12th. And also, there’s the Night of Terror in November. It’s a possibility for a gathering of friends because there’s more possibilities for a program about our history that will have guests sitting on the edge of their seats. Norway is having its suffrage centennial this year. The June events may be over, but there’s an international conference in November 2013 that promises to be interesting. For more information. Chick History has news items worth subscribing to. #1. #2. 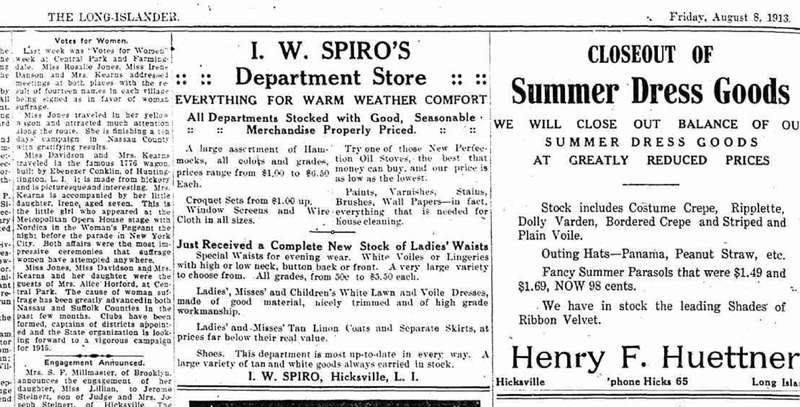 Women’s issues that haven’t changed since 1911. #1. #2. Activist school in UK was once called Suffragette Summer School. #1.165 years since the Seneca Falls convention of 1848. #1. #2. And if you haven’t ever traveled to Seneca Falls, NY, it’s still warm weather right now. Visit our page on Seneca Falls resources. Video of the Declaration of Sentiments, 1848, reading by Amelia Bowen. Video about the “Spirit of 1776” resolution that declared July 1, 2013 Wagon Day in NYS. Ode to the “Spirit of 1776” wagon. News items to think about: Bad jokes about women’s rights aren’t funny these days. #1. #2. Long Island exhibit includes women’s suffrage. #1. #2. And what about Votes for Women on the east end of Long Island? #1. #2. The Women’s Equality Agenda highlights. #1. #2. NOW impatient with politicians with histories of objectifying women. #1. #2. Another suffragist ancestor honored. #1. Illinois suffrage centennial produces play. #1. #2. The force feedings are still remembered. #1. #2. Suffrage Wagon has its own YouTube channel. We’re posting new videos all the time. Visit Suffrage Wagon’s feature platform. Susan B. Anthony is a corker! Find out for yourself! They called her Aunt Susan and she had so many adopted nieces, people couldn’t keep count. That’s why this post features a ten-minute audio clip from “Jailed for Freedom” by Doris Stevens, published back in Grandmother Edna’s day, that gives you a feeling of almost being there. Susan B. Anthony died before the ratification of the 19th amendment that gave women the right to vote in 1920. So when August 26th comes around this year, at a time when people aren’t usually thinking about Aunt Susan, consider the possibility of having a party. There are lessons to be learned by putting on a skit about Susan. How about courage? Vision. Inner strength. She had her eye on the prize of women voting and wouldn’t give up. These themes are eternal. I didn’t even have a script when I directed and produced my own Susan skit back in 2010. I went to the primary sources, lifted lines straight from the record, recruited the cast, and everyone had a blast with dress ups. The audience got the point. So if you’ve been toying with the idea of putting on a program for August 26th (Women’s Equality Day) or a special fundraiser or other event for your friends, organization, or club, try Susan B. Anthony’s arrest in 1872 and her trial for voting. The trial was a hit at the Susan B. Anthony birthday party I organized in February of 2010, and it’s especially relevant for other special events because it’s an example of nonviolent civil disobedience. Susan was arrested for voting, and everyone knew back then that women couldn’t vote. The audio clip on this post is a wonderful resource, plus the internet is a great resource for finding quotes from Susan, as well as her speeches, for reading out loud. Here’s Susan B.’s petition to Congress in January of 1874. And resources from Susan’s trial record. Think about it! It’s a great way to introduce young people to Aunt Susan and there are great parts: Susan, the officer who arrests her, the district attorney, and the judge. Drama, conflict, plenty of action. Great lines. 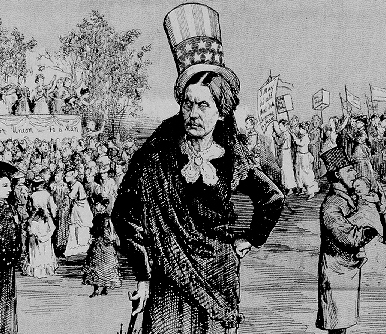 Now –see how you do on a quiz about Susan B. Anthony. Did you know about the picketing of the White House by suffragists? This is a story we can’t tell often enough. The headquarters of the National Woman’s Party in Washington, DC (aka the Sewall-Belmont House & Museum) has prepared this video using some archival images many people have not seen. These wonderful and energetic folks at the Sewall-Bemont House & Museum have launched a virtual campaign called “Share Your Story. Save HerStory.” It’s precisely the kind of campaign that builds leadership through stories of the suffrage movement, which is the mission of Suffrage Wagon News Channel. Contact Elisabeth Crum at 202-546-1210 ext, 17, or send her an email with your answers to the following questions: “Why is woman suffrage important to you? Why will you vote this year? Who are the women (past and present) who inspire you to vote? What do you think women should know about the WNP and how will that move them to vote in 2012?” Stories will be collected as blog posts, video, Facebook, and Twitterview. For more information. Suffragist Rosalie Jones of Long Island used a yellow horse-drawn wagon. Edna Kearns traveled in another suffrage wagon, the “Spirit of 1776.” They toured, gave speeches, recruited supporters. At the end of the day, they were special guests of honor at dinner. See article below in The Long Islander. Note, however, that Edna’s daughter is recorded as Irene. Actually, it was Serena. And little Serena was a suffrage poster child. Her onstage appearance in a suffrage pageant at the Metropolitan Opera in New York City is noted in this article., as well as the effort put into organizing on Long Island for Votes for Women. Suffragists picked up their soapboxes and went to town! 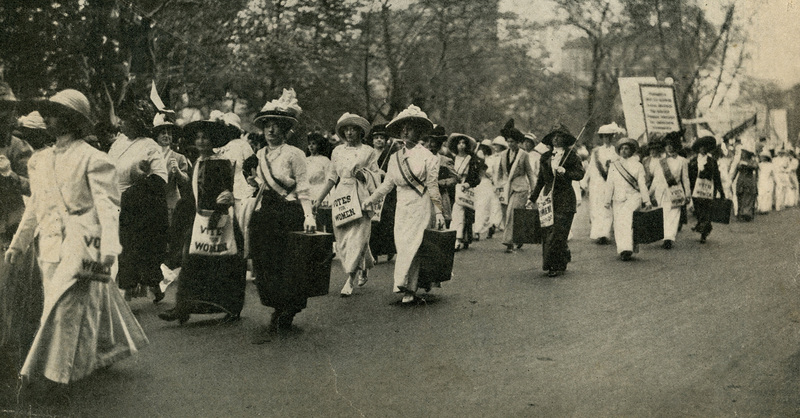 Not only did the suffragists march in huge parades, but in some events they even carried portable soapboxes (such as in the photo below) in the event an opportunity arose for them to stand up on a street corner and speak. It was a novelty for women to speak in public back then as Susan B. Anthony knew well. And it was equally daring to climb up on a soap box and speak for as long as a crowd gathered to listen. This took considerable courage. The suffragists had to duck water thrown on them and smile in the face of insults and worse. 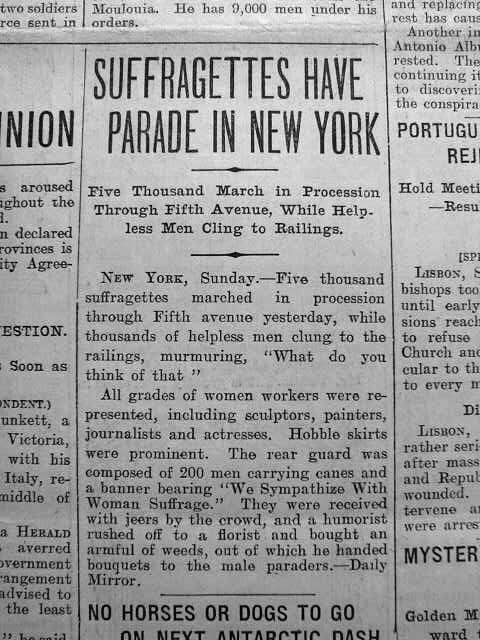 The men who marched in suffrage parades also faced jeers and insults. Critics accused them of tagging after the “girls.” One man anonymously wrote a book entitled How it feels to be the husband of a suffragette. It’s not only funny, but you get the point. And it’s free for the download. The book is funny. It’s true. It’s a great reminder about the process of social change and where change meets resistance. The article below also points out another perspective –the crowds of people watching the Votes for Women parade and how it was an enormous attraction to see women out in the streets, exposing themselves to make their point. There came a time, of course, when parades became old news. But they served a useful purpose. May 1911. from the collection of Pamela Hobbs-Glackmeyer.